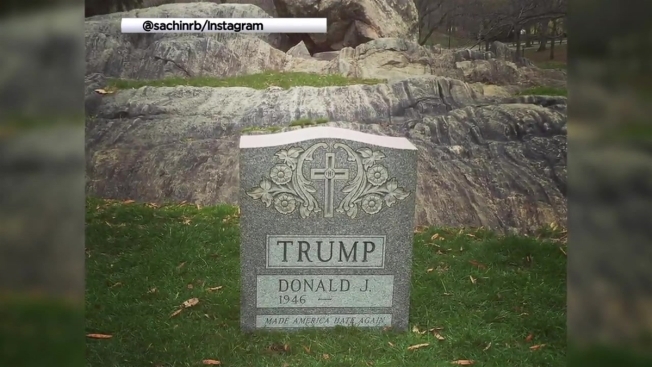 A Brooklyn artist is behind a headstone in New York's Central Park bearing Donald Trump's name and the epitaph "Made America Hate Again," police said. The headstone, which included Trump's birth year, 1946, mysteriously appeared in the park on March 27 before being taken away by parks department workers. Police have identified the artist behind the headstone as Brian Whiteley, who did not respond to requests for comment Tuesday from The Associated Press. Authorities tracked the stone to a monument dealer, who gave them the customer's name and security camera footage showing him loading it into a truck. According to his website, Whiteley earned a masters degree in fine art at the School of Visual Arts in New York. He describes himself on his website as an artist who "explores phobia, paranormal experience, radical politics, the occult and religious phenomena through research, performance, and visual art practice." In a March 30 interview, the then-unnamed artist told the New York Times he was trying to remind the Republican presidential front-runner "what kind of legacy he was leaving behind." Whiteley wrote on his Facebook page after his name was released by the Times that he does not regret the stunt. "A Secret Service Interrogation, NYPD at my doors. A permanent file on record. A project 6+ months in planning. Do I regret a thing? NO," the Facebook post reads. "Artists, please stand with me and make our voices heard." Whiteley's website also lists the tombstone as one of his "politics" works, calling it "The Legacy Stone." Other works include dressing as a clown and visiting graveyards — Whiteley's site describes it as "an on-going series on public performance and media manipulation."